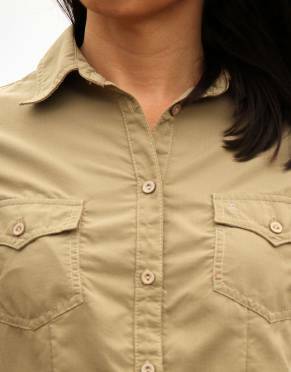 Get insect protection, moisture wicking, and built-in SPF with this short-sleeved BUGTech™ shirt. With a feminine cut and classic design, it’s the easy way to look great and stay protected in Africa. Get insect protection, moisture wicking, and built-in SPF50+ with this short-sleeved BUGTech™ shirt. With a feminine cut and classic design, it’s the easy way to look great and stay protected in Africa. Although we recommend a long-sleeved shirt in our technical fabric as a safari essential, we can't deny that a short-sleeved shirt is a great item to have in Africa and warm-weather destinations. 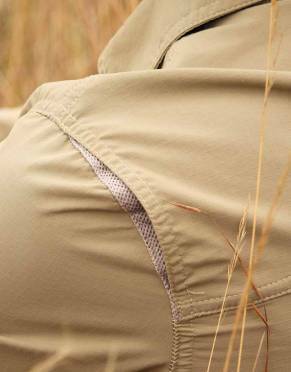 Combining our classic cut for the modern safari-goer and our specially-developed BUGTech™ insect protective fabric, get protection from biting insects without compromising on style. 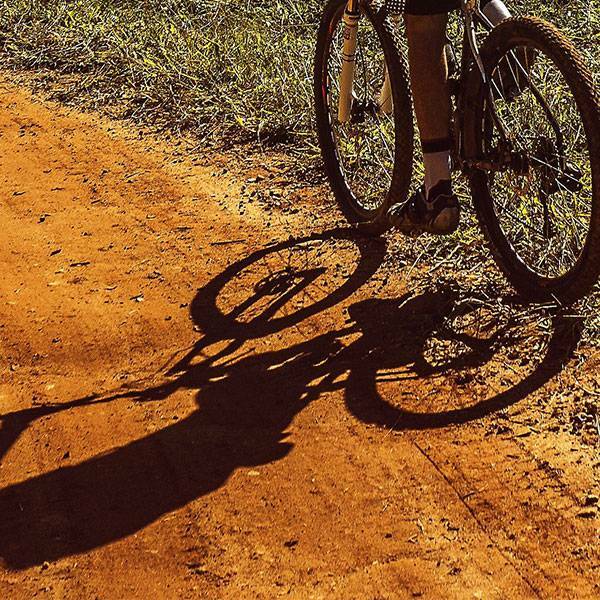 The +Vent system and moisture wicking properties are additional features to keep you cool when the weather heats up too. 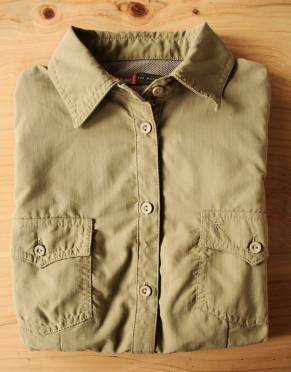 In lightweight ripstop fabric which releases wrinkles from packing with ease and dries quickly, this is a superb shirt to add to your safari and travel wardrobe. Many other brands forego this testing and rely on intensive marketing campaigns to sell their garments. 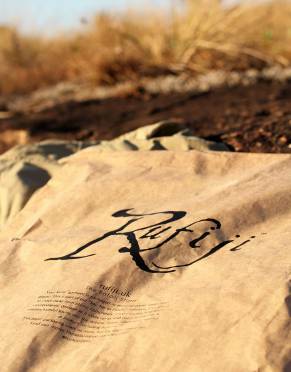 In developing the BUGTech™ fabric, we were guided by our new mantra for our Rufiji™ clothing range: "No marketing hype. Just the facts." 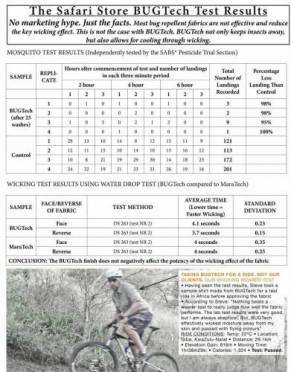 In ensuring we could deliver a product that performs, we undertook to put the Rufiji™ BUGTech™ SafariElite Short-Sleeved Safari Shirt through thorough in-house and independent tests. Three easy steps to ordering the right size: ⊙ With so many different brands from all over the world available on the high street and online, the only way to get your size right the first time round is to compare a garment you own and which fits you well with one of our garments. STEP 1: ⊙ You will need a measuring tape, a flat surface such as a table, a notepad to record your garment's measurements - and your own collared long sleeve shirt which is a comfortable fit. ⊙ Tip: If you do not have a measuring tape, use your credit card. The long side of a credit card measures 8.5cm and the short side is 5.4cm. Simply use the centimetre measurements on our chart and divide by 8.5cm to get an idea of how many credit card lengths equals the measurement you are recording. STEP 2: Referring to the images above, place your shirt flat on the table and record the following measurements: ⊙ 1/2 Bust/Chest - Across the front of the shirt from armpit to armpit; ⊙ Centre Back Length - From the nape of the neck on the back of shirt to the bottom hem; ⊙ Sleeve Overarm - From the top of the sleeve where it joins the shoulder to end of the sleeve hem (ignore image for sleeve length above as that is for long sleeve shirts). STEP 3: Compare your measurements with our size chart and order the size closest to your measurements. Chest/bust is usually the most important measurement if you are in a hurry, but checking all three will make for the most comfortable fit.